I have made this bean soup over and over again, Tony loves it, I love it, it is just so good. It is from a cook book that will remain nameless but I think with my edits we’re safe. I make it using Chipotle Peppers in Adobo Sauce. You have probably seen this can to the right when perusing the grocery isles? I picked it up at Planet Organic awhile ago knowing an opportunity to use them would come along. Does anyone else do that, just buy different food ingredients in hopes to use them one day? My favourite thing to do when travelling is grocery shop, I have got some of the best stuff that way! I tried this recipe for the first time last winter and when it asked for chipotle peppers, jalapeno peppers that have been smoked and dried, I was stuck. Until ‘Oh yeah, I have a can of chipotle in adobo sauce’! What’s adobo sauce? It’s a general Latin American sauce of tomatoes, garlic, vinegar and spices (so says Wikipedia). I thought, that’ll work. What I love about using these is they go a long way and I freeze the rest (not in the can). In a soup pot, saute the onion and celery (and garlic if using it) in the olive oil until soft. Add everything else, including the vegetable stock, stir and bring to a boil. Once boiling, turn down to a simmer and cook uncovered until the sweet potatoes are softened, about 10-15 minutes. Once sweet potatoes are soft, take it off the heat and puree with an emersion blender. You can use a regular blender but remember not to close the lid tight, better to let the soup cool and then blend, the steam can cause an explosion. Bad for hands and ceiling. I have also seen cooks put a dish cloth between the blender and lid so the steam escapes and is not trapped when blending. Whatever you do, be careful and if you make soup now and then, go get an emersion blender, the best kitchen investment you’ll make. 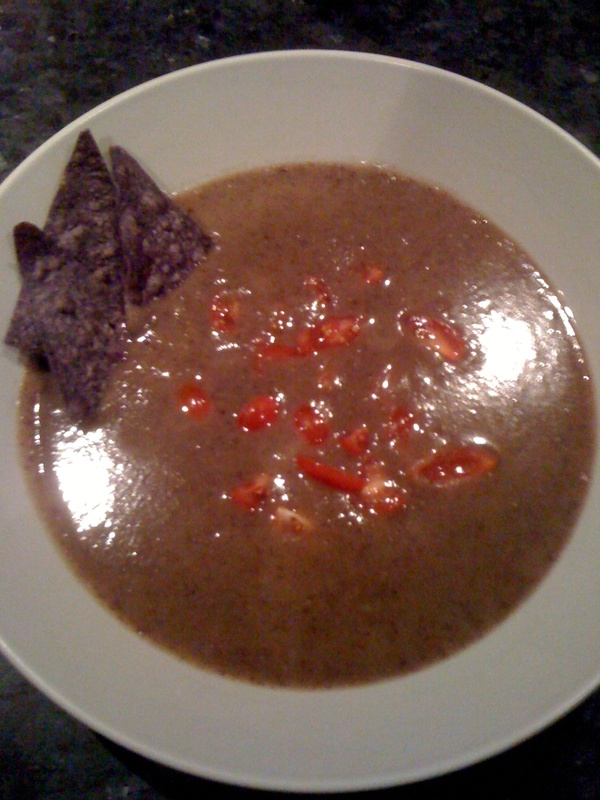 I like to serve this soup with diced tomatoes, red peppers or avocado on top with a splash of lime juice and tortilla chips. My good friend Dana owns the Yoga Shala in Calgary. In her monthly newsletter there will be a section dedicated to good food, it’s called ‘Just Eat It’. This month we published Kale chips. I adapted this recipe from a raw food class I took. I really enjoyed the raw food class, some of it was basics I had known and other things I had just not bothered to try. I have been experimenting with raw food recipes for awhile now. I don’t eat all raw, there is something so nourishing about a good bowl of soup in the winter that I have a hard time giving up. I’d say raw is more prevalent in the summer months for me. But I have replaced my ‘fruit+hemp powder morning shake’ with a ‘green smoothie’ (fruit+lots of spinach or kale or any leafy green+water). I feel a big loss if I miss out in it in the morning. It is simply the easiest way to get 1-2 servings of fruit and 2-4 servings of veggies and all before lunch! Keep increasing the ratio of greens to fruit, it helps maintain blood sugar levels. Sip throughout the morning. Kale chips seem to be a popular raw food snack. It is so easy and so good for you. Kale is a leafy green and is high in vitamins K, A and C, fibre and an antioxidant. This veggie packs a healthful punch and even Dana liked them (maybe because they are disguised like chips). Tear kale off the thick stem into bite size pieces, place in bowl. Add the rest of the ingredients. ‘Massage’ the oil mixture into the kale, so it is evenly coated. Place in single layer on sheets in dehydrator for 2.5 hours. Or, preheat oven to lowest setting (150F-175F), turn oven off. Place kale in single layer on baking sheets, put in oven. If you have an oven thermometer, check the temperature every 30 minutes and warm oven again when it drops below 90F. Your finished when kale is dry and crisp, about 2 hours. I have an oven that heats to 150F, I just leave it on, flipping and moving the kale around every 30 min. If you are a raw food purest, this would be inappropriate, but drying kale in the oven is still more beneficial than eating potato chips! If you love them, double or triple the recipe. Eat it.